We are welcoming new NHS and Private patients to register with our practice. Whether you register on our NHS practice for your routine dental care or take advantage of our high quality, affordable private dental services such us tooth whitening, dental implants, invisalign teeth straightening, full porcelain crowns, veneers, you can be assured of our commitment to a professional service. 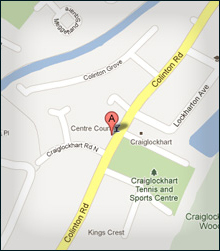 I would like to complement The Craiglockhart Dental Practice for their outstanding customer service. From Nadia at reception, always with a confident smile putting me completely at ease and her impressive efficiency to Patricia who is professional and business like ( in a good way, explaining the procedures and what is going on) . As an extremely nervous patient Patricia is able to make me feel at ease and her patience, often stretched by me I am sure, is calming and sympathetic. The dental nurse too is quick to help and shows concern when I show signs of nerves. I had quite a few appointments taking a couple of months and can honestly say that the service was fantastic. The receptionist was efficient and the dental nurse and dentist very kind, gentle and professional at all times. They were really all lovely and I would definitely recommend this practice. I had a very positive experience and am delighted with the end results . I would like to thank dentist for the excellent treatment I received over a course of 3-4 months while attending Craiglockhart Dental Practice for specialist treatment. His attention to detail is outstanding and the manner which he carries out his work is a credit to the practice. Patient satisfaction is clearly very important to him and it shows in his work. I could not recommend them highly enough, so much so that friends and family have now joined the practice! I am very happy with the service I have received. All staff are very pleasant and helpful and I am very pleased with the dental treatment I have received. The staff are always friendly and welcoming, the treatment is professional, fuss-free!! Copyright © Craiglockhart Dental Practice. All rights reserved. Dentist Edinburgh - At The Craiglockhart Dental Clinic we emphasise personalized attention and we offer complete dental services, family dentistry and cosmetic dentistry.